I was in the process of waking up at 1 p.m. when my mother sent me a picture message on my phone. She's been spending her birthday in the city with her boyfriend, cruising China Town and Little Italy for the best food in existence. 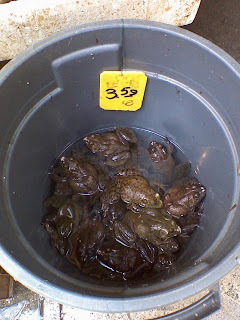 And though I ended up going back to sleep for another two hours, I have finally comprehended that the photo she sent me is of a bucket of live frogs, being sold on the street for $3.59 each. The City is truly a wonderful and unique place, where one can see everything that has ever been done, all in new and interesting combinations of dumb.